Amid U.S. Senate approval of a mandatory nationwide system for labeling genetically modified foods, a new consumer survey from Coast Packing Company and Ipsos Research finds that only half of Americans say they understand the content of food labels — and less than a third believe them. The nationwide survey of 1,000 adults, conducted in late May, examined both awareness and behavior around food labeling, querying consumers about what they read, understand and believe – and how they act, based on that information. The Coast/Ipsos research revealed pronounced gender and generational divides in how we respond to data conveyed on food labels. When it comes to posted ingredients, less is more both for women and millennials: 40 percent of women agreed that “a food label with fewer ingredients has a positive effect on my purchasing decision,” vs. 25 percent of men, and 33 percent of those in the 18-34 age bracket endorsed that view. Millennials are avid readers of food labels (68 percent vs. 62 percent overall), and more than half say they understand food label content (54 percent to 50 percent overall). Fully 35 percent of millennials believe the content of food labels, highest of any age group. o Almost two in three Americans (62 percent) read food labels, with women (65 percent) more likely than men (58 percent) to do so. o While millennials are most likely to read food labels, those ages 35-54 (56 percent) are least likely to take that step. o Thirty percent of women and a like number of millennials say they understand the concept of “minimally processed” on food labels – highest among all demographic groups. o More women (40 percent) than men (25 percent) agreed that food labels listing fewer ingredients is a net positive, with millennials coming down in the middle (33 percent). 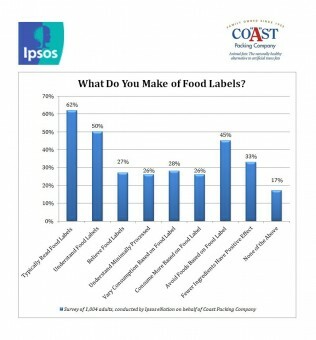 According to the survey, food label information tends to be more a deterrent to consumption that a license to eat. Overall, 45 percent of Americans avoid certain foods based on the content of food labels, with women (54 percent) more likely than men (36 percent) to avoid certain foods based on food label content. Older adults, ages 55+ (53 percent), are most likely to avoid certain foods based on the content of food labels, while younger adults ages 18-34 (42 percent) are least likely to steer clear of foods based on label information. By contrast, only 26 percent of those surveyed consume more of certain foods based on what’s on the label. “Food labels are intended to help us make better food choices, but they’re not working nearly as well as they should,” said Eric R. Gustafson, CEO, Coast Packing Company, the number one supplier of animal fat shortenings in the Western United States. “It’s clear from the data that Americans aren’t ignoring food labels, but a great many don’t fully understand or believe what they read. The Coast Packing/Ipsos study was fielded from May 25-27, 2016. Ipsos eNation surveys consist of a minimum of 1,000 completes with adults 18 years of age or older in the contiguous United States. The sample includes individuals selected from the online segment of Ipsos’ iSay/Ampario Panel, and is balanced to be representative of the general population based upon region, gender, age, and household income data from the U.S. Census Bureau. Results have a margin of error of +/- 3 percentage points. For a copy of the survey results, please email admin@edgecommunicationsinc.com.